Spain, as expected, have won the European Championship and now go on the face Scotland - home and away next month - for a place in the World Cup. Spain had strolled to this final with over 170 points in their two games, whereas the Dutch had had to battle all the way against Russia. That difference in preparation for this game seemed to influence much of the first half, but in the end Spanish power told. Spain began well with an early try from Marina Bravo, but thereafter it was the Dutch who looked most likely to score as they put the Spanish defence under more pressure than that had seen throughout the tournament, and found them at times wanting. Although the line held it was at times as much luck as judgement as whenever they achieved a turnover it almost invariably became ill-directed punts downfield that were returned within seconds. However, Spain had a huge advantage up front, and as the first half progressed the Dutch scrum was gradually worn down until the final 10 minutes where it did not matter who put the ball in, it was Spain who came away with it. With the Spanish line out also working perfectly, despite the significant Dutch height advantage, by the end of the half Spain had weathered the storm. The second half was a totally different game. 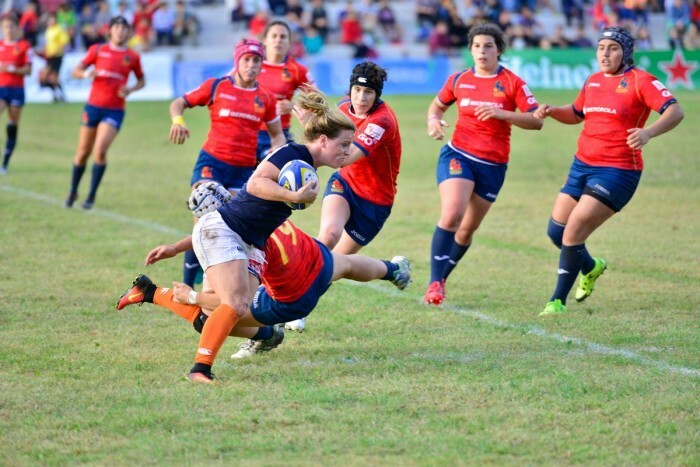 A new plan was put into place to take advantage of their overwhelming advantage up front, and within three minutes of the restart a Spanish penalty was kicked into the corner, the lineout became a maul, and the Dutch had no answer to the inevitable try for Jeanine Alejandra Vinueza. The Dutch occasionally threatened to break out, but two Patricia Garcia penalties further extended the lead to 16-0 leaving the Dutch with no way back. Two more tries followed from Bravo and Perez before finally, with just seven minutes left, the Dutch at last broke the Spanish stranglehold and Shereza Pool scored a deserved try for the Netherlands. The Spanish were not finished, two more tries followed with a Del Pan try and a Garcia conversion ending the game, giving Spain the European Championship title and a tilt against Scotland for a place in the World Cup. Spain were clearly the strongest team in the tournament and fully deserved the win. They were by far the strongest team up front, but that advantage was rarely needed as the speed, strength, fitness and awareness of the backs simply overwhelmed most opposition. And in a way that is also Spain’s greatest problem – other than the final against the Netherlands and a match against (ironically) Scotland last year - they have faced little strong opposition since the pool stages of the last World Cup. The Netherlands were stronger than any Dutch team we have seen in competition for, perhaps, 10 years or more. The integration of many of the former professional sevens players created an exciting, attacking team that deserves to be given more chances to play. Given a stronger pack they might have even recorded a shock result in the final. It is a pity that it will probably be at least a year before they take the field again. History had always gone the Belgian way in this fixture, but this is a very different Russian team from anything their have fielded before. It took them seven minutes to get ono the board through Ekaterina Kazakova, after which four more tries followed in under fifteen minutes. Halftime came with the Russians 38-0 ahead. The restart saw the deluge continue. Teslenko, Seredina, Kudinova, Trapeznikova and Ledovskaya all added to the score before Belgium finally managed to find some possession, using the maul effectively resulting in a try for Ciska de Grave on 70 minutes. Even so, Russia still had the last word through Akhmedova. Russia fully deserved their third place – and who knows what they might have achieved if they had any more preparation than the single weekend camp prior to the tournament, or even if they could have played Switzerland before the Netherlands. Certainly if they had played the first 20 minutes of that opening game as well as the did for the rest of the tournament the outcome could have been very different. They did suffer from a tactical naivety, playing almost the entire tournament as if it were a prolonged sevens competition, but given the stunning talent available to them that rarely mattered – faced with Six Nations, or even Spanish, opposition the outcome might have been very different. As it is, it is a regret that it may be a long time until we see this team again, if we ever do. Belgium must be disappointed not to be more competitive than they were. Though wins were perhaps not expected, to see last year’s European Trophy winners as outclassed as they were in two of their games, and less than convincing in their one win against the team that eventually finished sixth, was a surprise and perhaps a step back from 2015. The revival of Germany’s test team could be a challenge to Belgium’s ranking in European rugby. An entertaining game between two well-matched teams began finals day in Madrid. Both had been in the receiving end of some hidings in the pool phases, but on a glorious autumn day in Madrid they put all that behind them. The two teams know each other well and have their own trophy for the fixture - the Konektor Cup – which the Swiss had won on the three previous meetings., and they began on top again with a try for Natascha Kehrli after just eight minutes. However the spirited Czechs battled back and shiortly after the Swiss experienced no. 8 Sabrina Walti briefly left the field, pulled ahead thanks to a converted try Martina Damborová, Pavlína Cuprová adding the extras. Half time came with the Czechs still 7-5 ahead. The Swiss regained the lead early in the second half with a try from fullback Carole Casparis, but a yellow card for Swiss lock Judith Oriwal shortly afterwards put the Czechs back in the game, with Dominika Havelková’s try changing the lead for the fourth time and putting the Czech 12-10 ahead with 17 minutes to go. But within five minutes the Swiss were back on top again through Casparis, Lami adding the conversion this time. It was a crucial score as the pace slacked with a tiring Czech team. With ten minutes left Casparis made it a hat-trick of tries giving fifth place and the Konektor Cup to the Swiss. Switzerland came through in the final forty minutes of a tough week – possibly the toughest they have ever faced in their short test history and from which they will take away some important lessons. As with the Czechs, they did well to survive the onslaught of the opening two games. A couple of years ago some of their players told us of their ambition to achieve a top 20 ranking - they now know how hard that will be. Czechia – despite the big loss to Spain – will probably come away broadly content with their performance. They certainly posed a test for the significantly higher ranked Belgians, and came closer than ever before to a test win against the Swiss, only falling away in the final quarter which suggests that the ability is there to finally record a test win, all that is now needed is improved match fitness.